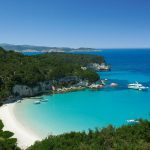 Antipaxos is a tiny place (only 4km long), totally unspoilt and truly the place to holiday if you really want to get away from it all. 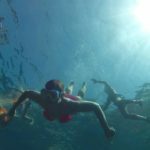 There are no shops (those staying at our villas on the island can order deliveries of supplies), no real roads, only a couple of tavernas and just a scattering of houses. 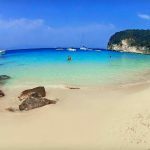 Antipaxos is all about peace and quiet and glorious beaches, such as those at Vrika and Voutoumi, famous for their transparent waters and breathtaking settings. 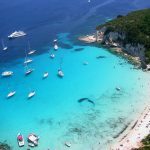 Boats bring in day trippers once a day from nearby Paxos, but once the last boat has left in the late afternoon, total tranquility falls on the island, the sun sets and the stars and moon shine brightly in the night skies. 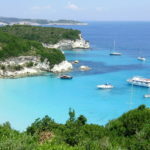 Utterly charming in every way… that is how we could describe Villa Phoenica, in Antipaxos! Intoxicating views take in the nearby vineyards & the turquoise sea. 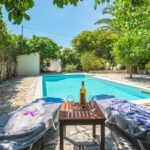 Enveloped in total peace and quiet and boasting a lovely pool, Phoenica is a unique, simple villa built with & inspired of love & respect to this unique island! 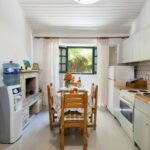 The main entrance of Phoenica leads into an open-plan dining and kitchen area, fully equipped furnished. The combination of wood-beamed ceilings and windows create a luminous environment. 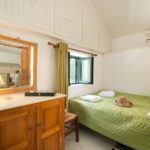 The two bedrooms, a double and a twin room both with views of the gardens and countryside, are accessed from this dinning area. 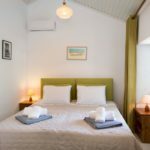 The overall effect is one of a simple & beautifully crafted, which makes Villa Phoenica an extremely homely villa. 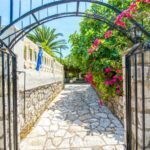 As you walk in through the gate you will be greeted by the most idyllic views of the surrounding vineyards and then of the sea of this little island paradise. 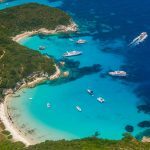 A few steps lead up to an amazing outside seating area, where you can enjoy both your morning coffee and a glass of wine late in the afternoon enjoying the unique and unforgettable sunset of Antipaxos!! 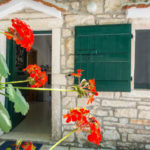 Just outside of the main entrance of the villa, under the almond trees, you will find the outside dining area, which is perfect for lounging and relaxation. 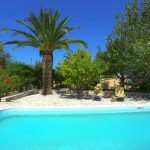 Swimming pool perfect location will offer you the ultimate privacy that you seek from your holiday as it is surrounded by almonds & lemons, to enjoy your favorite book under the Greek sun!!!!!!! 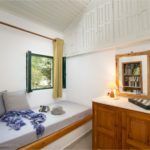 Phoenica is totally private, totally romantic and totally peaceful, especially in the evenings when you only have the stars and the moon for company… the perfect place for really getting away from it all. 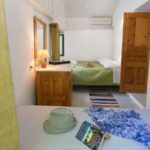 One double bedroom and one twin bedroom both with garden and pool view, an open-plan dining and kitchen area and a bathroom with shower.